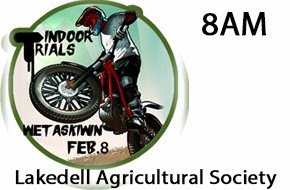 ALberta Trials Riders Have organized an indoor for fun trials! We are going to have indoor trial on February 8 Saturday from around 9 am till late afternoon. Cost for renting facility is $250 per day. More riders less money per head. Roger F. will required help on Sunday February 2 to load obstacles on his trailers at his farm. More help - will be better for all of us. Roger had surgery and he is doing this for all of us- please help. I will put more information very soon and sorry for a such a short notice. Trials is a great sport - let's rock!!!!! We are going to be there around 9am. Roger F. will bring his trailer fully loaded of huge tires. We will certainly need some man power to set up obstacles. Please come and help. SGC will bring Demo Trailer around 10 am- this add more fun and variety. We are hoping that this event/fun ride will break winter nirvana. At the and of the day we will need help to load this staff back- please reserve some time to help too.